NaNoWriMo – Nyah! Nyah! Nyah! I walked in my door after hanging out Wednesday evening. I did not leave my house again until I left for work this morning. During that time I pumped out over 9,000 words, including working on Thanksgiving Day, to get this award. I now return to my regularly scheduled life. Pass this gal a drink and bring on the holidays! 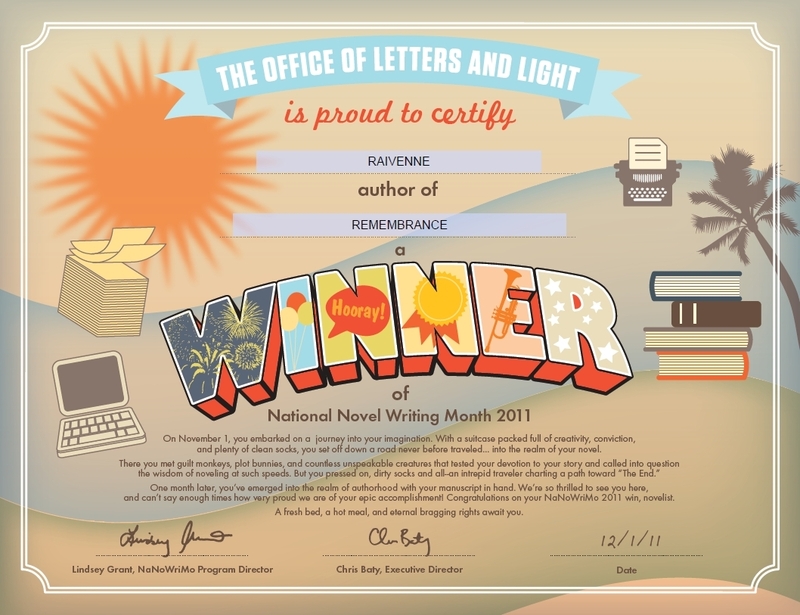 NaNoWriMo (National Novel Writing Month) 2011 was a great experience and I am so glad to have participated in it. For those unfamiliar with it, National Novel Writing Month is a challenge to write 50,000 words of your novel within the thirty days of November. There are no prizes other than a fill out and print-it-yourself certificate and the bragging rights of knowing you did it! For me, who had yet written Word 1, that was more than enough. 30 days seems like plenty of time to pen 50,000 words until you BS half the month away. On November 21st I had 41742 words in and only 8 days to meet the 50k challenge with Thanksgiving weekend square in the middle of it. Naturally, temptation rears its ugly head. I am invited to two events, I really wanted to attend and the weather this past weekend was freaking beautiful for late November in NYC! BEA-U-TI-FUL I tell you! It was so unfair! I looked at the sun through my window, watched the clock past toward and beyond the event times, sighed and typed away. I had no choice. At one in the morning of Day 28 I hit 51441. Enough for NaNoWriMo, but my personal challenge was 52k, so I still had work to do. Twenty-four hours later, I officially validated my work on their website at 52,640 words and received the certificate posted above. I know I would have gotten off my duff and eventually started pounding out the novel that has played in the far recesses of my mind for quite a few years now. Still, the NaNoWriMo challenge to write 50,000 words in 30 days was the perfect kick-start and learning experience. I am nowhere near having a manuscript I would email to good friends, let alone a publisher, but I I am considerably more on my way to that goal than I was thirty days ago. Now, 57012 words in, I can already see the first couple of chapters I planned in my original outline are likely to be trashed. They are only marginally informational to the development of the core characters and I can do without them. I have already gone in side plot directions, I had not thought of before, and oh! -I’ve killed off a character! In addition, I have also learned some scenes are better told in narrative, while others are best done in character dialog. Most important, I’ve learned I’m verbose (I KNOW – whodathunkit?!). I am going to have to take an editing weed whacker in the first drafts to fine-tune this when I’m ready. Geesh! And I though writing poetry was difficult! 9000 words? Bring ’em on! Is it a certificate of completion, or a judged award based on what you wrote? If the latter, did you get a prize? Either way, good job, and congratulations! The former, Q. 🙂 Although, we do get special offers from publisher sponsors. ….you mean… you vortexed yourself?!!? 😀 Seriously, that’s great. Good on ya.